Chladni patterns show the geometry of the different types of vibration of the guitar top plate. This site has an introductory explanation of modes of vibration and a library of photographs of the Chladni patterns of a guitar top plate and an intact guitar. Thomas is a student at the Fachhochschule Regensburg in Germany. Sketch of a simple mode of vibration. Photographs of the Chladni pattern of: mode (0,2) of a uniform rectangular aluminium plate. In this pictures, the lines are formed from sand that has collected at the nodes, but has been shaken off the moving regions. The top plate of a guitar is more complicated in shape, and so the nodes also have a more complicated shape. White sand was used for the black-painted aluminium plate, and black sand for the guitar top plate. One of the modes is comparable with a mode of vibration of a rectangular plate. In this mode the nodal lines separate the plate in three parts, so it can be compared with the (0,2) mode of the rectangular plate, with the middle part moving 180° out-of-phase with the ends. 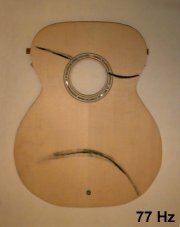 The modes for the guitar plate are complicated by the presence of the sound hole and the bracing. How are Chladni patterns formed? There are at least three different methods. The plate can be made to resonate by a powerful sound wave which is tuned to the frequency of the desired mode. The plate can be bowed with a violin bow. This is easiest if one choses a point that is a node for most of the modes that one doesn't want, but not for the desired node. The plate can be excited mechanically or electromechanically at the frequency of the desired mode. For the photographs on this site, a small (4g) magnet was fixed to the bridge. An oscillating magnetic field (provided by a coil connected to an audio amplifier and a signal generator) was used to provide an oscillating force whose frequency is tuned to the resonance of the mode. Experiments using different masses showed that the mass of the magnets caused us to underestimate the frequency by about 10 Hertz in some cases. But there were also patterns obtained with a magnet which could not be obtained without a magnet (e.g. by a speaker). That means, that the vibrating system has changed qualitatively by adding the magnet to the plate. In all cases, some finely divided material is placed on the plate. The material used here is fine sand. When the plate resonates, the motion becomes large over most of the surface and this causes the sand to bounce and to move about. Only at or near the node is the sand stationary. Thus the sand is either bounced off the plate or else collects at the nodes, as shown in the photographs. Why are Chladni patterns useful? The adjustment of the top plate is important to the properties of the final instrument. The most important adjustments are thinning the wood towards the edge of the plate, and thinning the braces. Chladni patterns provide some feedback to the maker during the process of adjusting the plate to its final shape. Symmetrical plates give symmetrical patterns; asymmetrical ones in general do not. "The acoustics of violin plates" by Hutchins, C.M. Scientific American, Oct.1981, 170-176. "Experiments with free violin plates" by Jansson, E.V., Moral, J.A. and Niewczyk, J. J. CAS Journal Vol 1 No 4 (Series II) 1988. "The Physics of Musical Instruments" by Fletcher, N.H. & Rossing,T.D. Springer-Verlag, New York, 1991. What is a sound spectrum? The text and images are copyright. Please do not use them without permissionand attribution.